Fired Up on the Streets, but Not in the Boardroom - Is Corporate America Missing the Mark? "Hands up, don't shoot!" symbolizes the terror some Americans feel when encountering a cop. You might not live in Ferguson or Baltimore, but chances are you have either experienced prejudice or witnessed it. We see outrage and violence in the streets with high-profile cases like those of Michael Brown and Freddie Gray. Yet, research shows that not all people think racism is an issue in their communities. While many people have protested the unjust actions against people of color, there has been significantly less noise made over inequality in the corporate world. Institutionalized racism is not limited to police brutality. As we engage in lively discussion about what happens "out there," prejudice on Wall Street is being overlooked. It is a less sensational story. "Unconscious bias" in the corporate world rarely receives the media attention and public demonstration that it does in the streets, but we should not ignore it. The time is right to look in our own backyards and offices to come up with workable solutions that promote our nation's evolution, and thus spark economic growth in our neighborhoods and companies. We cannot expect progress if we do not take a harder but necessary look inward and relate this back to our own lives. The recent 50th anniversary of the Watts Riots and the one-year anniversary of Michael Brown's death conjures many images of police brutality against blacks. The headlines ring eerily similar although they span half a century. On August 11, 1965, a black motorist was arrested in the Watts neighborhood of Los Angeles, California for allegedly driving under the influence. The resulting altercation with the police escalated into six days of police brutality and violent riots. The Watts Riots lead to nearly 4,000 arrests, injuries to 1,032 people, and 34 deaths. On March 3, 1991, black taxi driver Rodney King was beaten by four police officers in Los Angeles, California following a high-speed car chase. He suffered skull fractures and permanent brain damage. The officers were tried in court and acquitted. Public outrage ensued - resulting in the largest riot in Los Angeles since the 1965 Watts Riots. On August 9, 2014, unarmed black teenager Michael Brown was shot and killed by police in Ferguson, Missouri with his arms up. His dead body lay abandoned in the streets for hours. Similar to the Watts and King incidents, Ferguson has experienced police brutality and protests in the aftermath - with the civil unrest and complaints of police intimidation continuing one year after Brown's death. On April 12, 2015, Freddie Gray was arrested in Baltimore, Maryland for allegedly possessing a switchblade. He died of a traumatic spinal cord injury while in police custody. Many believe the police caused his death. Americans took to the streets seeking justice for Freddie and an end to police brutality. Looking at the headlines from 1965 to 2015, the common thread is that a black man was either killed or brutalized by law enforcement. Has anything improved in 50 years? Why does this even matter to people just living their lives and going to work? perception of events has to also play out in the office. In May 1992, following the Rodney King verdict, the Washington Post and ABC-News released a study showing that most Americans - white and black - felt that the four officers tried for beating King should have been convicted of a crime. In the study, 77% of 18-30-year-olds said the officers committed a crime, and 57% of adults over age 60 agreed. When asked if they thought the officers in the King case should have been found guilty or innocent, 68% of all respondents said guilty, including 94% of black Americans and 64% of white Americans - a majority in both racial groups. In 2014, the internet-based market research firm YouGov repeated the question posed in the 1992 study to a group of Americans regarding the Michael Brown case and the indictment of Officer Darren Wilson. The results were drastically different - showing that Americans were significantly less aligned on the issue than they were with the Rodney King case nearly a quarter of a century earlier. How is it possible that we have less agreement on these issues today than in 1992? 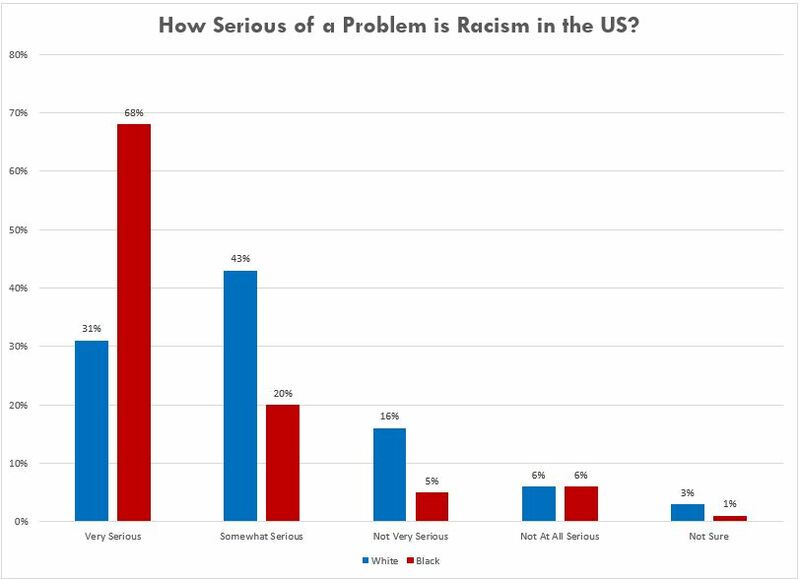 Many Americans do not believe racism is still an issue. Instead, programs like affirmative action are accused of being reverse racism when their goals are to serve as a solution and address chronic historical inequality in society. The fact is prejudice against black Americans is still pervasive in 2015. These recent incidents with the police resulting in deaths and the debate over the Confederate flag 150 years after the Civil War ended are indicators that collectively we have a way to go to create a more inclusive and mutually-understanding society. Huffington Post and YouGov recently polled 1,000 adults on their perception of racism in America. When asked "How serious of a problem do you think racism is nationally?" only 31% of white respondents replied "very serious" as opposed to 68% of blacks. It is difficult to begin addressing racism and prejudice in America if we cannot admit that it exists. Many Americans either believe that it does not exist or that it does exist - just not around them. When polled by Huffington Post and YouGov on their perception of racism in America, the majority of white respondents (56%) replied "racism isn't really an issue in my community." 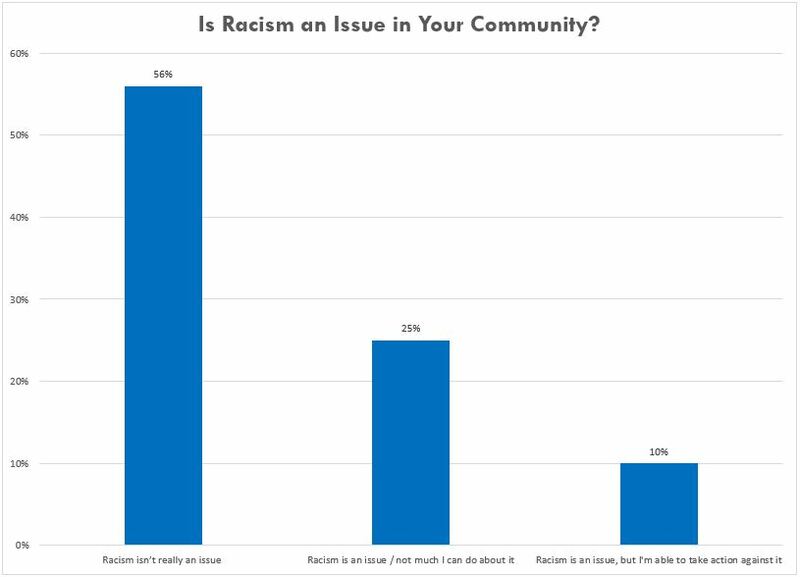 Another 25% believe that "racism is an issue in my community, but there's not much I can personally do about it." What does all this data and police brutality have to do with the workplace and everyday people? If we replace "community" with "company" in the Huffington Post/YouGov survey, the issue may start to hit closer to home - maybe too close for comfort. Companies do not exist in bubbles. They are also a part of our society. If American communities are struggling with issues of race and equality, then so are our companies. To advance as a nation, we cannot ignore the Michael Browns and pretend that the boardroom does not have work to do too. We do not have to see flames for there to be a fire brewing, and we should not fan the flames by turning a blind eye. If history can teach us anything, it is that this issue will not go away on its own. Racism and prejudice in America are permeating the boardroom, creating fewer opportunities for professionals of color to advance and climb the corporate ladder. Still, there is significantly less public outcry and media attention devoted to these very pertinent and critical issues. A 2015 Bureau of Labor Statistics report shows that of the entire population of professionals in management roles only 8.8% are black. 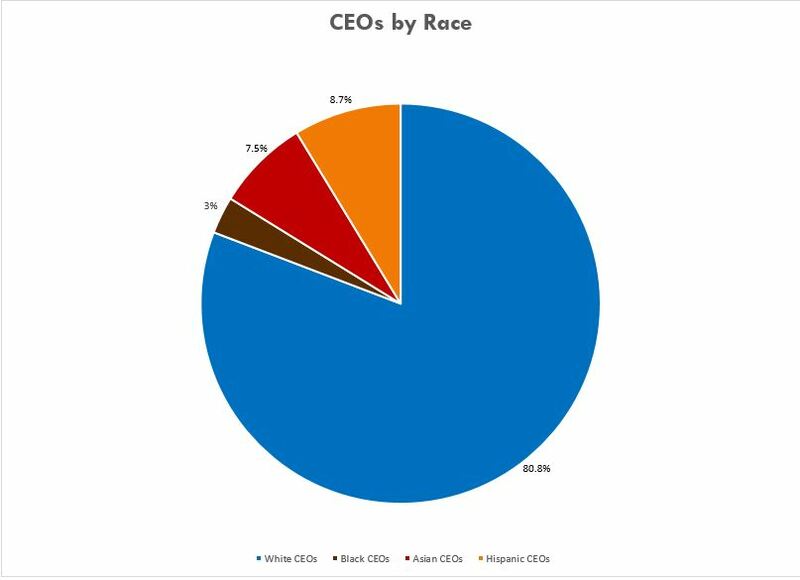 Of all the CEOs, only 3% are black. Looking at these statistics, it is hard to deny the workplace is struggling to reach parity when 11.4% of the US work force is black. The reason behind these numbers cannot just be about a "talent pipeline" issue. There have to be institutional hurdles and perceptions of race limiting career opportunities - possibly linked to a lack of organizational self-awareness that the company has a serious problem that it needs to solve. An article by Jarrett Murphy shows that the number of blacks in management positions has increased over the last 50 years. However, this number has stalled after the 2008 recession. The past half century is not devoid of positive advancement - we have made great strides. Yet our progress could be more significant and we should be more evolved as a society. What's the Solution for Corporate America? There is no formula to create a more diverse Corporate America, but many companies have developed diversity initiatives. This is a step in the right direction. Nonetheless, these initiatives need to be more widespread across industries and at each level of the corporate ladder. Statistics show that implementing these diversity programs can have a positive effect on the number of diverse individuals employed. Companies need to devote serious time and thought into the development of these programs - they do work and they will benefit the entire organization. In their article entitled, "The Architecture of Inclusion: Evidence from Corporate Diversity Programs," Frank Dobbin and Alexandra Kalev note that since the Civil Rights Act of 1964, corporations that create the infrastructure for diverse employees to succeed have increased numbers of white women, black women, and black men - three underrepresented groups. That is only if they create those diversity programs. What is stopping the companies that do not? Nothing should be preventing companies from diversifying when statistics show that organizations with more diverse employees outperform the rest. As we detailed in our recent article on diversity in Silicon Valley, a 2015 McKinsey & Company study showed that gender-diverse and racially-diverse companies are more likely to outperform less diverse competitors by 15% and 35% respectively. Some companies are not successful, and we discuss why they fail in their attempts to solve the diversity challenge in this article. These numbers are significant, and companies should consider these facts when deciding whether they should implement robust corporate diversity programs. Diversity initiatives are proven to have a positive effect, and diverse companies are proven to outperform the rest, but what are some other steps companies can take to diversify? Companies need to go beyond the mere acknowledgement that they have similar internal issues regarding race, prejudice, and inequality as we have in our streets and actively implement a change. 1. They should assess their hiring and promotion practices - notice trends and develop plans to increase the numbers of diverse employees. 2. They need to dedicate a real team, budget, and an accountability system so initiatives can have tangible impact. 3. They should implement mentorship programs and create opportunities for diverse employees to get the experience and exposure necessary to advance and become organizational leaders. At The Azara Group, we help companies address diversity challenges with long-term solutions. To evolve as a society, we need to come up with viable solutions and admit that this problem is everywhere - it is not just "out there" but also "in here." We are here to help companies develop 21st Century approaches once they stop fanning the flames and decide it is time to extinguish the problem.